When you are experiencing pest issues in your home, you want both immediate pest elimination that same day, and an ongoing protection plan to make sure your pest control issue does not reoccur. Economy Exterminators’ Pest Elimination Plus℠ is a customized pest control plan developed specifically for your home and family, to eliminate and prevent pests in and around your home. We will use our 40+ years of experience, and if necessary, our in-house residential entomologist (PhD) to develop and implement this plan for you taking into consideration your special needs and concerns. Call today for your FREE IN HOME INSPECTION, we are here to help! Not sure what pest has invaded your home or business? Reference our pest identification library to compare insects. Or go to Ask the Expert, Dr. Ken Ahlstrom can help you. Backed by the best guarantee in the business! Integrated pest management is a process in which pest risk is minimized while simultaneously minimizing the risks associated with pest treatments (such as pesticide exposure). We apply treatments strategically, ensuring that children, adults, and pets are protected from the potential dangers of pests and the products used to eliminate and prevent them. Biology & behavior – Knowing the specific pest’s life processes and habits enable our pest control pros to pinpoint only the areas that need attention. This precision targeting method allows us to use the least amount of treatment product with the greatest effectiveness. Crack & crevice treatments include intentionally applying materials in areas that pests love but that are difficult for children, adults, and pets to contact. 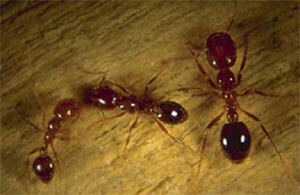 Call today for effective pest elimination and prevention! When it’s time for professional pest management, contact Economy Exterminators for a free pest inspection and let our experienced pest control team put our skills to work for you! We proudly offer our Pest Elimination Plus program to clients in Raleigh, Durham, Chapel Hill, Charlotte, Wilmington and the surrounding areas. Now it’s easier than ever to manage your account with Economy Exterminators! Just register your username and password and get automatic access to your online account to pay your bills online, see your pest control treatment history, and more!